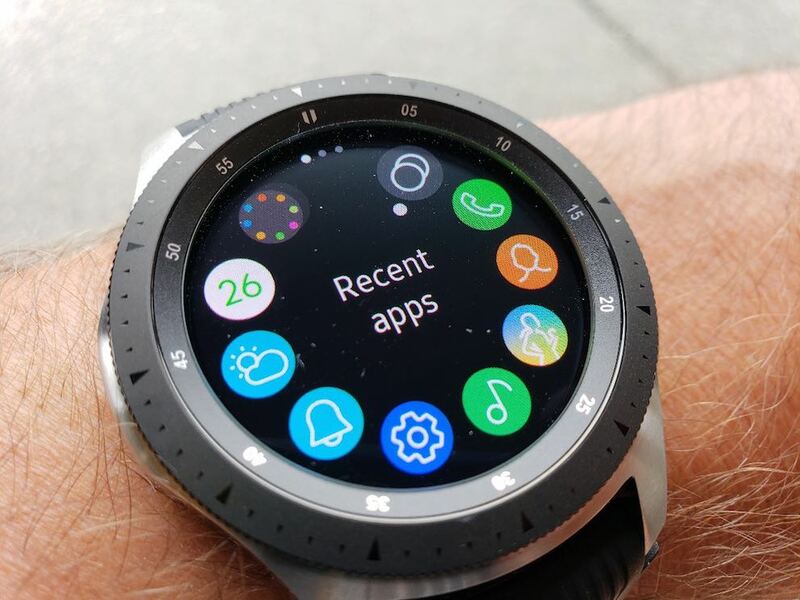 Samsung’s Galaxy Watch has a tonne going for it – a gorgeous design, an elegant and easy to use interface, fitness tracking, water-proof to 50m and most importantly, stellar battery life. In short it matches or betters almost everything on offer from its competitors. Compared to the Apple Watch, the Galaxy Watch looks and feel like a high-end watch instead of a rounded brick. It has a traditional circular case and bezel and at first glance with an analogue watch face selected, you’d be forgiven for thinking it was a standard mechanical sports watch. It is also a doddle to drive. As with the Gear S3, its bezel spins allowing you to cycle through on-screen menus and choose options, apps, etc on its touch-screen. 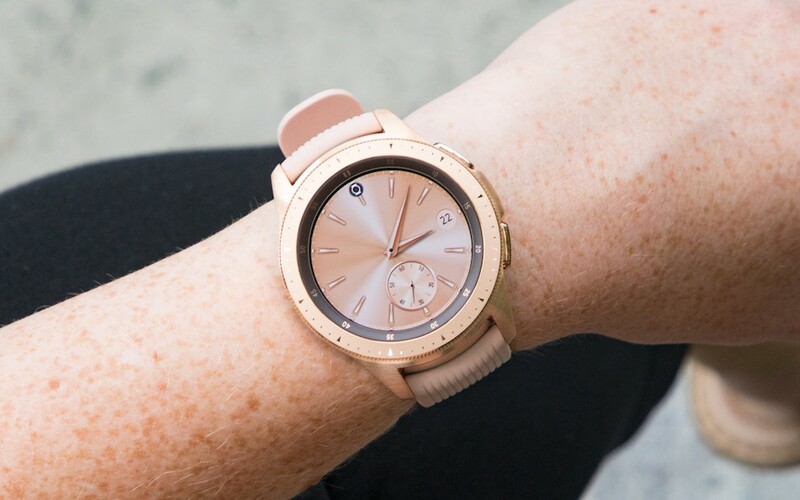 It comes in two sizes: The larger 46mm size has a two-toned silver-on-black colour scheme, while the smaller 42mm size I was sent is black or rose gold. The 1.2” AMOLED screen on the 42mm watch is super vivid and easy to see indoors or out. The rotating bezel also helps to makes this watch more durable. Many people I know have broken the glass screen on their Apple Watch, whereas the Galaxy Watche’s bezel is raised a few mm above its Corning Gorilla Glass DX+ display and this prevents it from getting scratched and broken from most impacts. As with previous Samsung watches, there are two buttons. They’re also slightly offset from the centre side location, which means they’re unlikely to get accidental pressed when you bend your wrist. While the squint and twist crown arrangement on the Apple watch is at best horrible, and the tap and pray you’ve got it right approach of Android Wear isn’t much better, spinning the bezel is hands down the best and easiest way to drive a smartwatch. It was intuitive and my fingers didn’t cover the touchscreen so I could see what I was doing. The other big difference, which is both a blessing and a curse, is Samsung’s Tizen OS. Tizen is incredibly miserly when it comes to energy consumption which translates into a solid battery life. 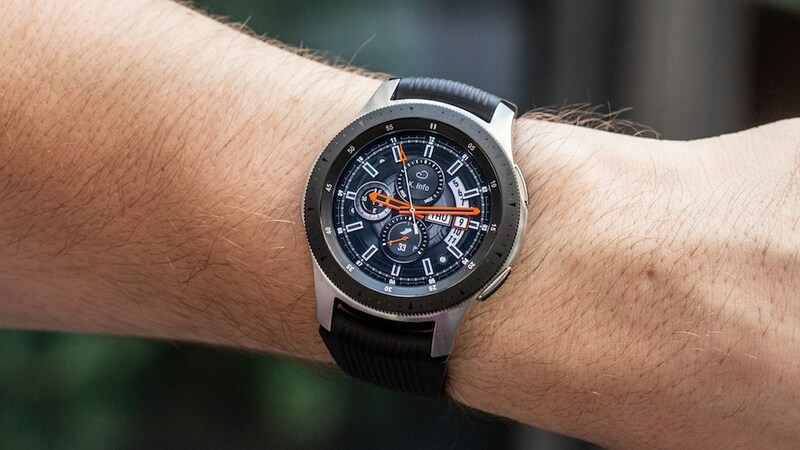 The large 46mm Galaxy Watch will run for four days with typical use while the smaller 42mm version runs for three days. This is days better than you’ll get with Android Wear or the Apple Watch. This is a device that is bulging with functionality and is heavily fitness-focused. It comes with additional sensors and Samsung have overhauled their Health app. The watch can auto-detect when you’re doing exercise. It vibrates to remind you to get off your behind and its sleep tracker also seemed fairly accurate. Best of all it is now properly waterproof down to 50 meters so it can get used in a pool or at the beach. Like the S3, the Galaxy Watch can act as a speaker/mic for your phone, so if someone calls, the watch vibrates and emits a ring time. You can choose to answer using the watch and then have a conversation using your wrist (which funnily enough saw me getting some very odd looks from passers by). All told the watch is easy to drive and incredibly versatile. It isn’t perfect though. As with its previous siblings, its apps store is still lacking some third-party apps, such as Facebook Messenger or WhatsApp. Bixby is baked in and it seemed to be a lot more accurate. 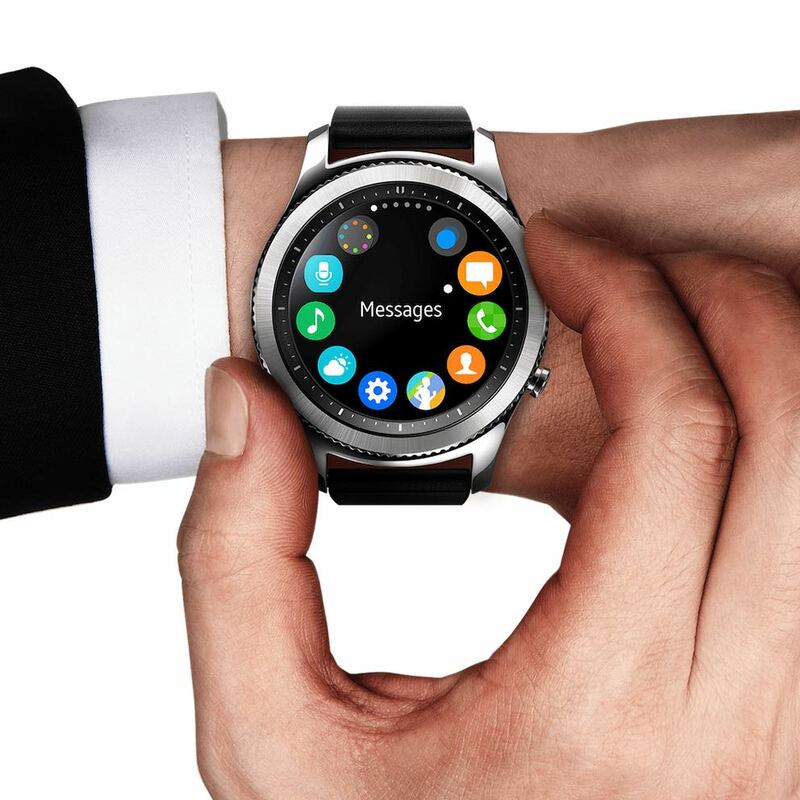 Samsung have taken their previous smart watches and refined them into the Galaxy Watch. 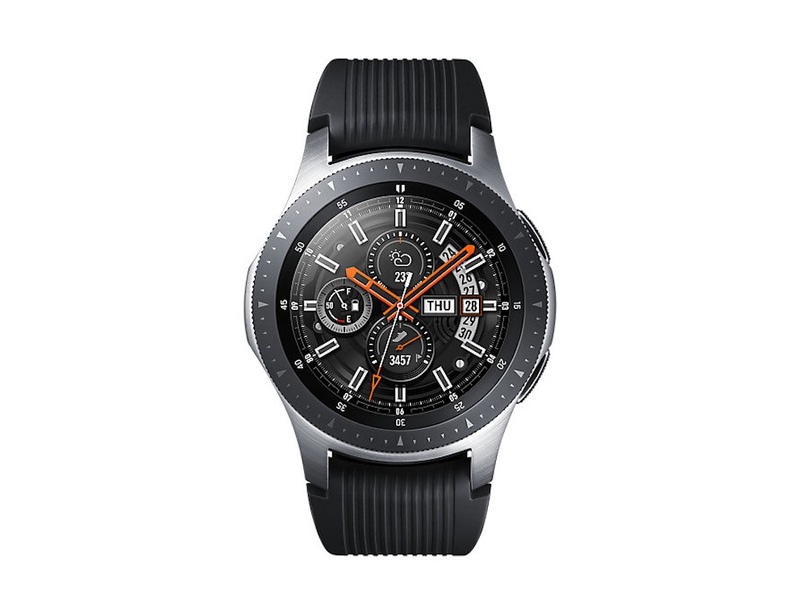 The addition of enhanced fitness capabilities, waterproofing and enhanced battery makes this a worthy upgrade option for Gear Sport or the Gear S3.